Join Lt. 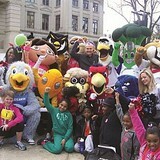 Governor Casey Cagle, Olympians and special guests for our 4th Annual Be Healthy Georgia Festival.Â This FREE family day at the Capitol kicks off with Atlanta Track Club's One Mile Fun Run and Kilometer Kids Dash followed by more fun and games with Georgia's pro sports teams, mascots and much more! There will be scholarships and prizes for the school or group with the most participants, so bring all your friends for this day of fun!